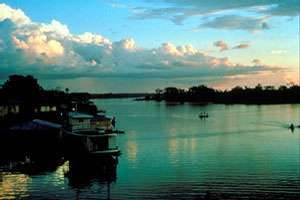 One of the worlds wonders, the Amazon has fascinated travelers and dreamers since its discovery in 1542 by Francisco de Orellana. It is 3,900 miles long, carries 365 times as much water as the Mississippi and is over seven miles wide at Manaus, a point located 1,000 miles from the Atlantic. The basin, drained by the river and its more than 1,000 tributaries, is the last great wooded wilderness of its kind. It contains over half the worlds species of birds and thousands of species of mammals and plants. Transportation in this enormous region is mainly on rivers, streams, canals and oxbow lakes, which crisscross the surface. River people and tribes of Indians deep in the jungle constitute this region's sparse population. However, the push of industrialization and the ecological damage it inherently causes continue to threaten this delicate ecosystem.